EXPERIENCE December Dreams this Christmas season at Fuzion Sunway Resort Hotel & Spa for 12 days starting Dec 14. A feast of a dozen traditional Christmas dishes from all over the world will be served, one a day until Dec 25 at the restaurants dinner buffet from 6.30pm onwards. We wanted to do something unique this season and also something to cater to all multi-cultural diners here in Malaysia. We were also aiming to bring traditional Christmas food from all over the world under one roof, said Sunway Resort Hotel & Spa chef de cuisine Khder Al-Issa. Khder, who has been cooking since the age of 18, added that all dishes will be served in one sitting on Christmas eve. All 12 dishes are traditional Christmas dishes found in countries like England, Italy, France, Germany, Portugal, Hungary, Finland, Jamaica and Hong Kong. Christmas is special to everyone, even to me and my family where I grew up and our must have dish every year is the turkey, said the Syrian chef. The 32-year-old, who used to help his dad at his restaurant when he was a child, said this years turkey dish would be prepared in two different recipes. One will be his very own roasted turkey recipe, Syrian Stuffed Turkey with green wheat and chestnut. This will be paired with the traditional meat sauce and cranberry sauce. Sticking to tradition, the restaurant will also be serving the well loved English Roasted Turkey with bread sauce and brussels sprouts to complete the feast. Apart from turkey, Fuzion will also be serving a French inspired goose dish with chestnuts, carrots, tomatoes and raisins. 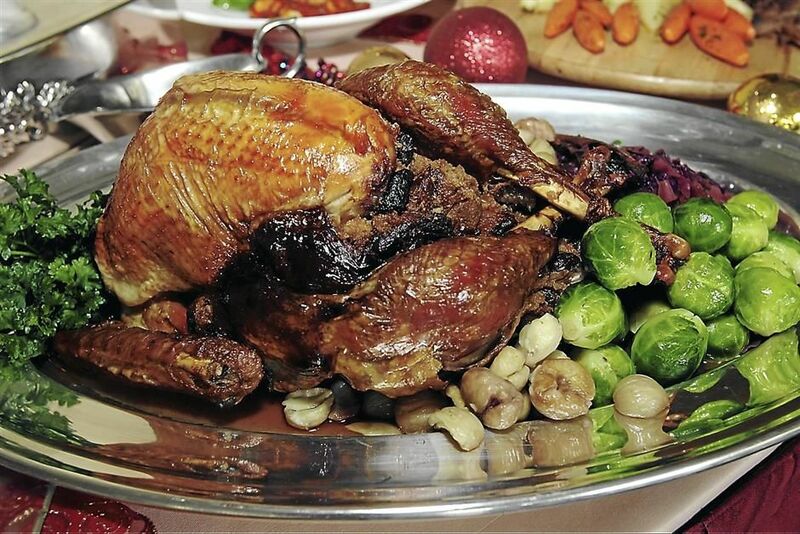 Goose meat will be juicier and tender, making it a popular alternative to the stuffed turkey for Christmas. This aromatic meat dish is the chefs favourite this year. Moving down south of France, the next dish is inspired from Portugal, the Portuguese Roasted Lamb. Marinated with paprika for a peppery taste, the leg of lamb is served with brown sauce on the sides. Not forgetting the roast duck, this Danish inspired recipe is stuffed with apples and prune, giving it a sweet taste. This fruity aromatic flavour complements the tender and juicy roast duck really well. Another meat dish would be the Hong Kong roasted chicken, marinated with oyster and soy sauce to give it the Asian taste. Meanwhile, there will also be the special Hungarian Stuffed Cabbage, also known as the Cabbage Roll. This popular dish from Hungary is normally baked, simmered or steamed and the beef wrapped in cabbage leaves. There is carrots, onions and mushrooms mixed together in the stuffing. Adding colour to the festive spread is the Jamaican Rice and Peas, which is cooked in a pot. This Caribbean cuisine contains Pigeon Peas also known as the red peas, which adds zest and texture to the simple dish. Also in the spread will be the Karelian Pasteis Potato and Carrot Casserole which is a popular traditional dish in Finland. These mini-tarts are made from a tiny rye-crust topped with pureed potato and carrot filling. Also on the list will be Fuzions Grilled Carp Fish with Jacket Potatoes with the recipe and cooking style inspired from Germany. Italian Christmas classics, which will be the Homemade Tortellini with Napolitano Sauce, Homemade Ravioli with Spinach and Ricotta Cheese and also the ever popular Struffoli with Honey. The tortellini will be served in a traditional tomato-based sauce with aromatic herbs like thyme, oregano and basil leaves. Struffoli, which is only served in Italy during Christmas and Easter is made from dough rolled into balls and deep-fried. This is then served with honey, cinnamon and orange rind for flavour. Fuzions 12 Days to Christmas buffet dinner is priced at RM89++ for adults while children between four and 12 years old eat at half the price. For Christmas Eve, the buffet is priced at RM128++ for adults and RM64++ for children. Christmas Day High-Tea will be priced at RM85++ for adults and RM43 for children. This is the writers personal observation and is not an endorsement by StarMetro.